This space wallpaper is an Envisat radar image acquired over the city of Boca do Acre in western Brazil. The city lies within Amazonas state, the largest Brazilian state by area, and almost completely covered by the Amazon Rainforest. The name Boca do Acre – or “mouth of the Acre” – comes from its location on the banks where the Acre and Purus rivers meet. 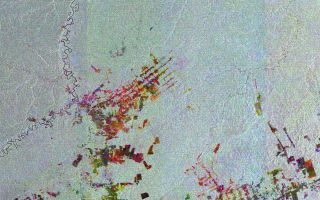 This space wallpaper is an Envisat radar image acquired over the city of Boca do Acre in western Brazil. The city lies within Amazonas state, the largest Brazilian state by area, and almost completely covered by the Amazon Rainforest. The name Boca do Acre – or "Mouth of the Acre” – comes from its location on the banks where the Acre and Purus rivers meet. This scene is a compilation of three images from Envisat’s radar. The individual images are each assigned a color – red, green and blue – and when combined, reveal changes in the surface between Envisat’s passes. In this image, the colors reveal large areas of deforestation – evident by the large, geometrically shaped plots cut out along linear roads.